We have been raised to believe that milk is rich in calcium and helps in making strong bones and maintaining bone density, and older women should drink more milk to prevent osteoporosis. 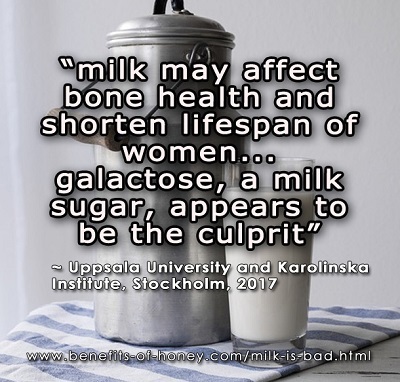 However, a study study by Uppsala University and Karolinska Institute, Stockholm (2017) revealed otherwise - drinking milk might affect the bone health and even shorten the lifespan of women. Galactose, a milk sugar, appears to be the culprit. Full account in: Milk is Bad for You, Ladies: Swedish Study.